The homestead family works long hours together every day but it’s important to not forget the fun! Here are some simple natural crafts for autumn that are enjoyable for the whole family. Did you know we have several fall holidays coming up? Use them to plan your natural crafts for kids and grown ups alike! I have to schedule time to craft and play because of how busy we are between homestead and home education. The spontaneous (yellow/type 1) side of me chaffs against that because some of the best fun I’ve ever had has been unscheduled! However, I’m also realistic. So, step one of actually doing some of theses natural crafts for autumn is to schedule them. Here are some fall holidays which might be helpful for calendaring these activities. If being spontaneous is your thing, skip this part! Crafts aren’t just for little kids, though I’ll get to them in a minute. There’s something relaxing and grounding about pulling out your fall craft stuff and taking ten minutes to make something beautiful. I’m really not “crafty”, but I do like being creative. I’m ok with clipart and glue, but I prefer natural materials for how they feel and how easy (and cheap!) they are to find. Plus, full disclosure, natural materials are way more forgiving of mistakes and craft-clumsiness, which I seem to suffer from. One of my favorite quick crafts is a grass dolly. The last time I made one of these sweeties, my little one ran off shouting, “Hey, everyone! Look at my grass dolly-lady!” Her excitement was a sweet reward for the six minutes of work it took to make one. The construction of these dolls is best left to parents and older children who have the dexterity. However, littler ones can help gather the grasses and give all kinds of assembly input. They can also help tie knots and stick in the odd pieces that fall out here and there. Gather some fall grasses with an obliging kid or kiddos. From late summer to first frost, the fields are full of gorgeous seed heads and a wide array of pliant straw-like weeds and grasses. I love the colors from this time of year, and not just those that come from the flowers. Keep the cut stems as long as you can so that you have creative options later on. Look for grasses that are still alive since they will be easier to bend. If all you have is dried straw or grass at this point, soak the grasses in water for a few hours before you start construction of your dolls. The thicker your grasses, the bigger your doll. Bigger can sometimes be easier to work with as you’re learning so gather six to eight or your fatter stemmed grasses. I leave the frilly seed heads on my stems as I plait and work with the doll so that I can see where they land in the finished product and how it looks. If I don’t like them, I clip them out later – or make a new, different doll. Gather your stems and bind their ends with a small length of twine – double knot to prevent slipping. Plait(braid)the long end of the straws to 4-6”. Tie the end with a double knot and fold in half. From the folded top, tie both parts of the braid together. Pull this tie tightly to form the head. Repeat steps 2 and 3 to form the arms. If you’re making a male doll, you may want to add a few more stems to give him beefier arms. Or, you might want to make a buff female doll, too. Maybe you could stage an ultimate grass-dolly wrestling match! Open the frame of the body you made (the part with the head) and insert the arm piece up inside so that it protrude from each side horizontally. If the arms look too long, either trim them or fold them in half or even thirds. Secure the arms with another string tied just underneath them, around the body. If you’re making a female doll, pull off the string at what is now the bottom of your doll and fluff out the grasses – this becomes her skirt. If you’re making a male doll, leave the string binding the legs. Watch the video if you have any questions about the steps. You should have something that roughly looks like a person. At this point, look at your doll and decide what’s missing. Sometimes I add a little to the head, because it looks flat. I decided this doll needed a fluffy hat. My daughter decided this doll needed wings to be complete. It’s up to you; the point is to have fun. You and the kids will spend some time flying your dolls around, having a doll tea party and probably shedding seed heads and grass clippings as you go. Ah, autumnal bliss. If you decide you like this idea, but would prefer a different medium, try these corn husk dolls from Nitty Gritty Life. FYI, this post talks about the history of Mabon, an ancient Pagan holiday. If that’s going to offend you, don’t read it – just Google “corn husk doll” since this is an equally ancient craft. I talk and write about a lot of different religions and customs from around the world because I find them fascinating. If that makes you uncomfortable, just skip it. Namaste. Fall is the perfect time for making vine baskets and wreaths because that’s the time of year that you typically prune back vining plants. Don’t be intimidated if this is something you’ve never done before. Like I said, natural crafts cover a multitude of mess ups and imperfections. No one will notice small mistakes because the beauty of nature speaks louder than your little goofs. For starters, try this simple twig star from Lovely Greens – it would look really need hanging over the porch or on the barn. For extremely detailed instructions on how to make a vine basket, please visit this post. For equally good instructions on how to make a vine wreath, please visit this post. Remember that these crafts will be better for older kiddos and adults. That does NOT mean that the littles can’t help; just that they can’t be left alone to do these projects on their own. There are several candle/wax links here so be sure to keep safety very much in mind for those. I love the images from this How to Make Ecoprints on Silk from Joybilee Farm – so gorgeous and not too complicated for me. Ooh, these would make nice gifts at Christmas, too. Why not kill two birds with one stone, so to speak. If you’re looking to get a head start on Christmas, you could try your hand at this MYO Pick Up Stick post from Schneider Peeps. Here’s another one I LOVE – make a Fall Leaf Garland from real leaves with Homespun Seasonal Living. 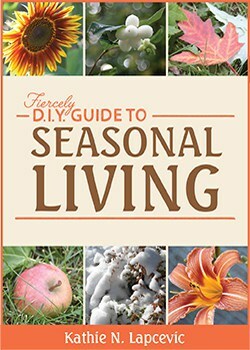 The tutorial for this is on her site and also in her book (her book has lots of other neat things for the season, too). FYI, this craft involves hot wax. Here’s a variation from The Magic Onions making leaf ornaments. Here’s Kathie’s book, if you’d like to get more information on it – the kids and I use it a lot during the year. Speaking of hot wax, Rootsy can teach you how to make dipped beeswax candles. I involve my five year old in this when we do it for school or as a family, but she’s been around hot wax her whole life and has been taught to obey. If you have any concerns about obedience or inexperience in your children under ten, listen to that intuition and have them help in other ways. Wax burns are serious! To learn to make your own candle molds for pillar-type candles, just visit this post. Follow the instructions that come with the paper, but you basically just forage fun leaves and twigs, place them on the paper in the sun for a few minutes and the items leave behind a shadow print of themselves. We use these prints for cards and crafts for our fall tree (more about that in our upcoming book, Homestead Holidays). Another great craft for the littles are these tissue paper lanterns we make for our lantern walk at Martinmas. We use glass jelly jars because they’re firm and strong for the little hands to work with. They are GLASS, though, so be sure to supervise. Always supervise, even when giving your kids creative space. To learn how to make these lanterns, visit this link. While the tissue paper is out, try making transparencies. This project will be at the high end of your age range because you do need some scissor skills. Adults can help design, too, because it takes an ability to imagine the finished product as you plan the layers. However, even the ones that don’t go exactly as you planned look super cool. Here’s a tutorial on how to make them from Little Bird Learning. Littles may not be able to dip wax candles, but they can sure roll them! Whenever we do candle making classes for older kids, we always have a sister class for rolling candles with the kids under eight. Learn how to roll beeswax candles with Joybilee Farm here. For those just learning their letters, try this simple paper craft from They’re Not Our Goats. If you’d like more educational materials that are written to help you create a rooted, natural education for your kids, I invite you to look into Rooted Childhood. I recently Meghann’s site and immediately fell in love. I’m super excited about this resource for people with young children. Happy Crafting with these Natural Crafts for Autumn! I’ve always wanted to dabble in basket making and weaving. Hopefully I’ll be able to in the coming years- it’s just so busy around here as we really build up. I love this post though- so many cute ideas! I know how you feel – so much to do! I have to make myself just plunk down and do it. Time goes by SO fast with the little ones and once there are older kids the whimsy needs to be scheduled or it just won’t happen. Fortunately, my five year old is persistent in reminding me!